The latest update on Americans’ debt and credit developments from the Federal Reserve Bank of New York (FRBNY) showed that total U.S. household indebtedness was $13.21 trillion at the end of the first quarter of 2018. That was a $63 billion (0.5 percent) increase from Q4 2017 and the 15th quarterly gain in a row. 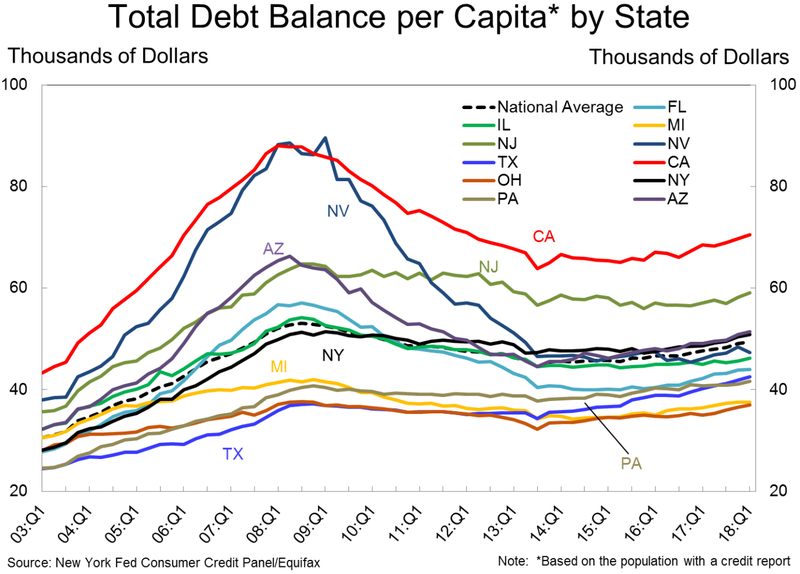 On the state level, California in Q1 once again had the highest total debt balance per capita. Although the “Great Recession” officially ended in 2009, most Americans have stopped deleveraging only during the past few years. 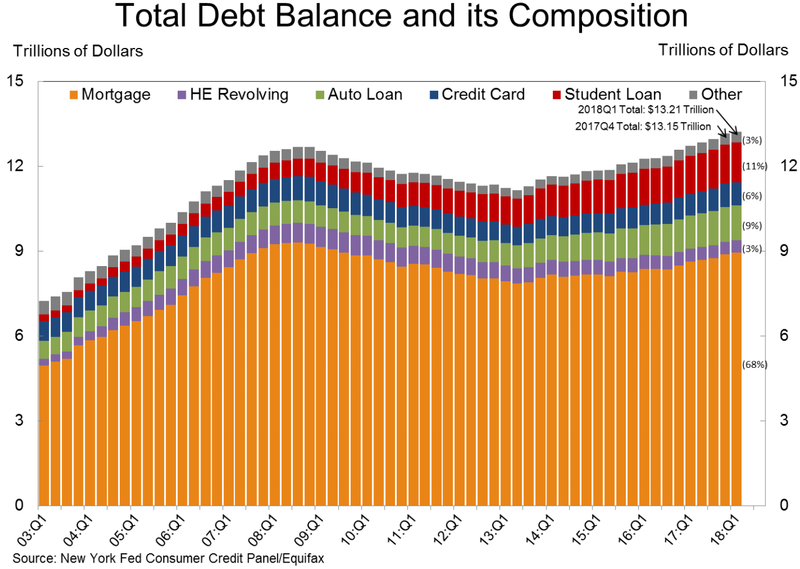 Still, the recent rebound has been considerable because overall household indebtedness is now $536 billion (4.2 percent) above the 2008 peak. 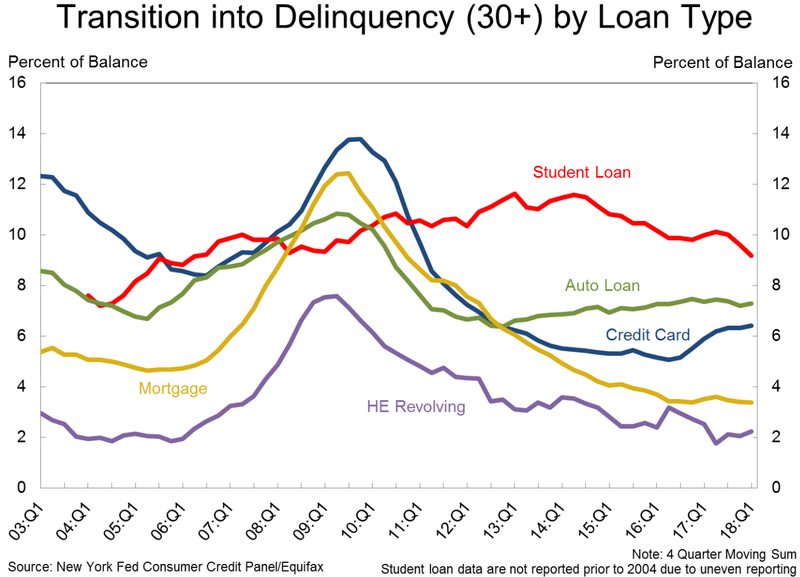 Rising mortgage, automobile, and student loan debt have all been big drivers of this uptrend but encouragingly only 4.6 percent of the total debt outstanding was in some stage of delinquency at the end of March. That was a decline from the previous quarter and one of the lowest readings seen during the current economic cycle. 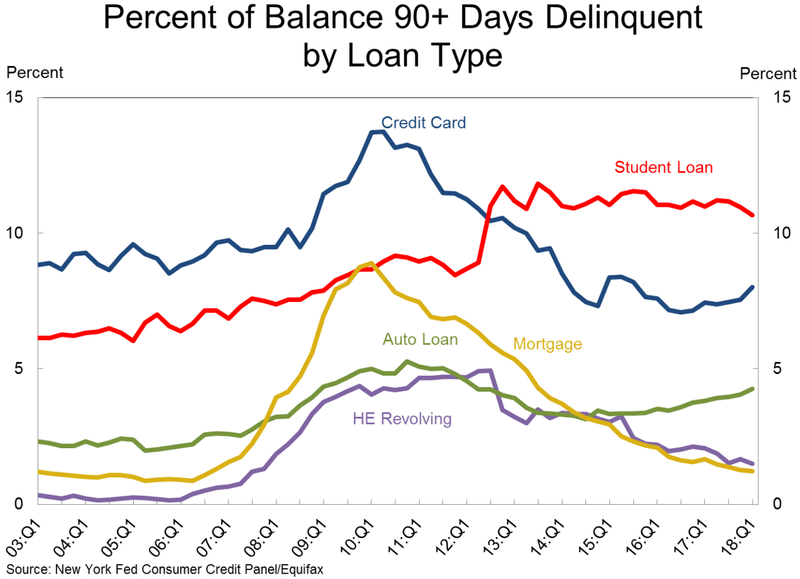 Altogether this suggests that even though total household debt in America has surpassed the 2008 high, the quality of that debt has vastly improved. 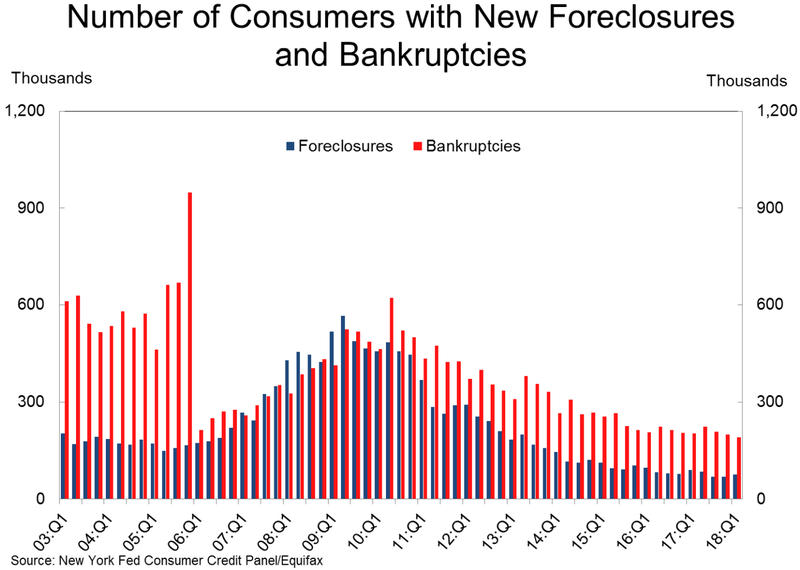 In fact, there were 192,000 consumers that had a bankruptcy notation added to their credit reports last quarter, a 4.0 percent decline from Q4 and the lowest quarterly total recorded in the 19-year history of this data series. 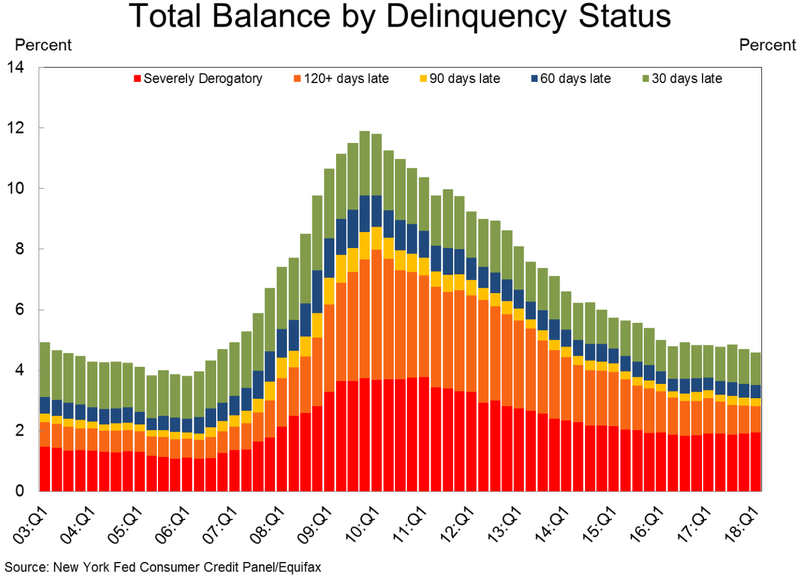 The proportion of overall debt becoming “newly delinquent” has also improved a lot during the current business cycle, although in recent years the downtrend appears to have bottomed-out. 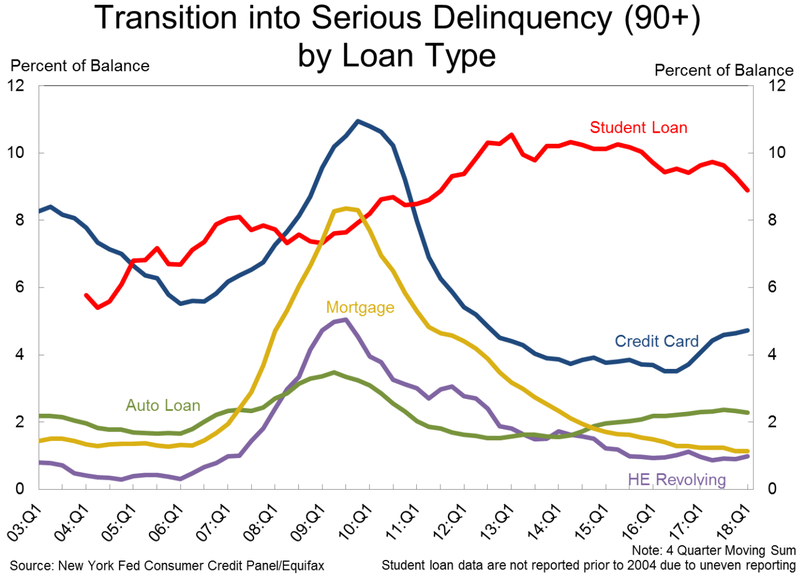 Car loans have been a major factor behind this trend shift, and even credit card balance flows into both early and serious delinquencies have started to pick up. At the same time, several banks have reportedly tightened their lending standards for certain types of consumer loans, according to the latest Senior Loan Officer Opinion survey from the Federal Reserve, including a modest net share of banks that have increased their minimum required credit score for credit card loans. 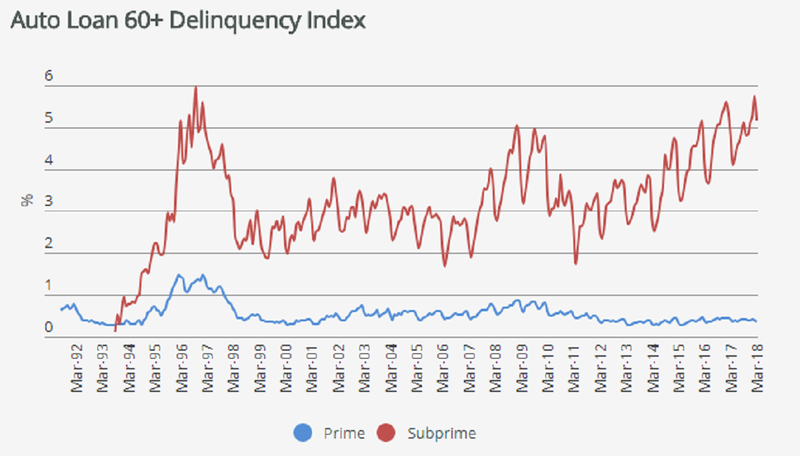 However, even if some banks have become less eager to lend, borrowing limits in general have still increased for twenty-one consecutive quarters (+0.4 percent in Q1 alone). 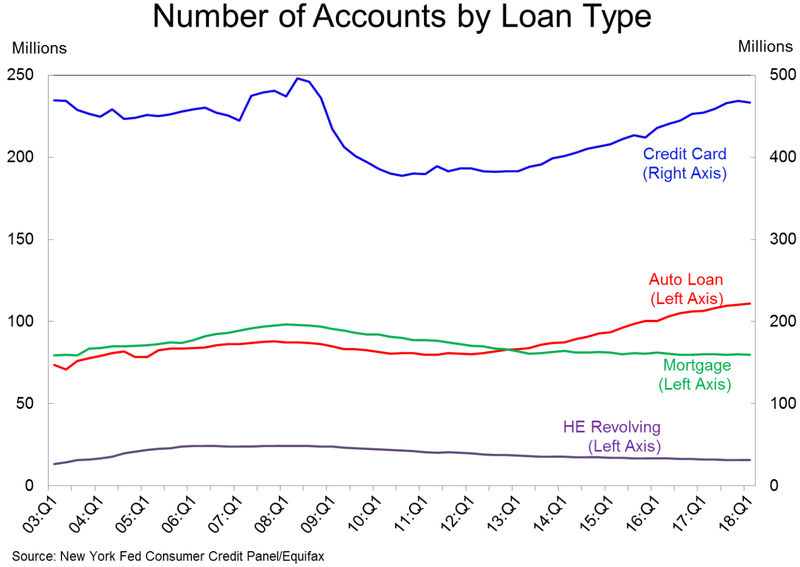 The number of credit inquiries made by Americans within the past six months, though, declined in the first quarter to the lowest level on record. That means that consumer credit demand softened even as the labor market continued to tighten and wage growth (future earning power) started to pick up. 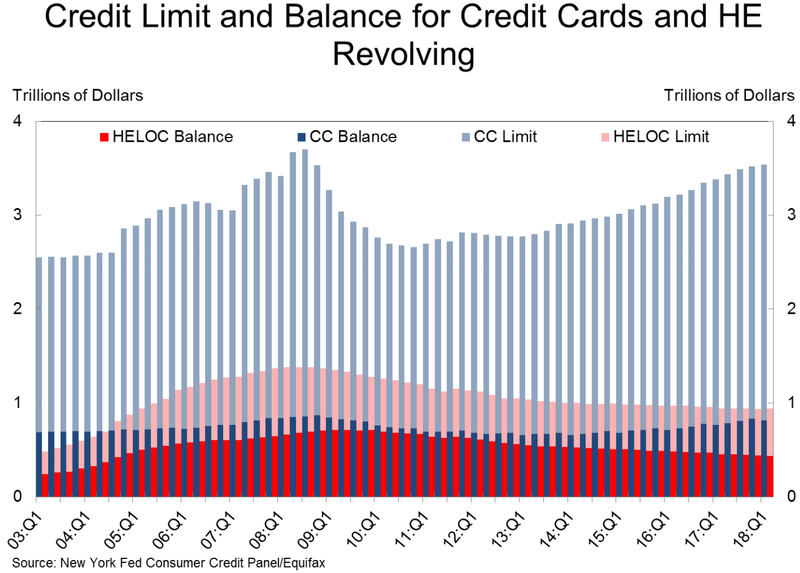 Such behavior could indicate that households are using the strong economy to shore up their balance sheets, an encouraging development that would help them set more money aside for retirement and avoid carrying excessive debt into old age.